L 15 1/2-19 1/2″(39-50 cm) W 35-43″(89-109 cm). Loud “kree-kree-kree,” usually heard around nest. Description: Sexes similar. 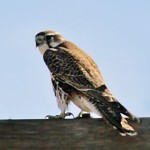 Light brown above, cream colored below with heavy spotting. Black wing pits seen when in flight. Narrow brown facial markings. Immatures more streaked with less contrast between back and underneath. Habitat: Often found in large tracts of open grassland. 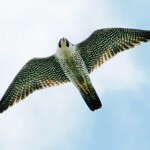 Nearby cliffs or rocky outcrops are necessary for nesting. Where in Nebraska: Occasional to rare permanent resident, and rare and local breeder in western part of state. Rare migrant and winter visitor in east. 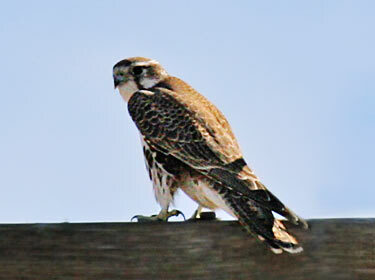 Field Notes: Most common of the three larger falcons (Peregrine and Gyrfalcon) in North America. 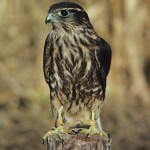 Fun Facts: The Prairie Falcon sometimes bathers in river shallows, but dust-bathing is more common.